While Nintendo of Europe announces Pokemon Bank has launched, Nintendo of America has said nothing yet. Nintendo of Europe announced this morning that the long-awaited Pokemon Bank and Poke Transporter app are available to download from the Nintendo eShop immediately in Europe. The service is also available in Australia and New Zealand. 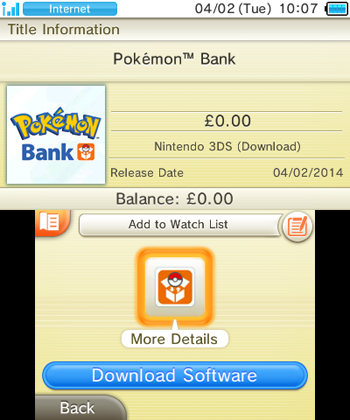 The European release follows the relaunch of Pokemon Bank in Japan. Pokemon Bank first launched in Japan on Dec. 25 and was shortly taken down from the eShop due to excessive traffic that overloaded the servers, and the Nintendo Network had global outages. Nintendo then decided to delay the launch of Pokemon Bank for the rest of the world. The Japanese app relaunched on Jan. 21. The Pokemon Bank app allows users to store Pokemon in online cloud storage, and Poke Transporter allows the transfer of Pokemon from Black/White and Black 2/White 2 to X and Y. Pokemon Bank will require a $5 yearly subscription fee, but it comes with a 30-day free trial. European Pokemon masters can download the app now, and its free trial will run until Mar. 14. After the free trial ends, the yearly subscription will cost Â£4.49/€4.99/$4.99. Nintendo of America has yet to release any information about the status of the North American version of Pokemon Bank and Poke Transporter and has not said anything further concerning the apps since Jan. 21 when it announced the apps were available in some Asian countries and asked people to stay tuned.